As I talked about last week there were a few obstacles that made this trip a little bumpier than would have been ideal! 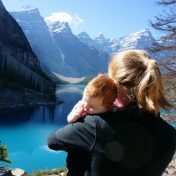 Here are a few of the things that H and I managed to do, and things that I would suggest for anyone visiting Van with a little one. I personally believe that Vancouver is super kid friendly so if you are heading there with an older munchkin do a little research and you will be spoiled with options of things to do! Granville Island: Walking around with H in the stroller there are so many things to look at, smell, and taste! Granville Island is a classic destination for EVERYONE! The Kids market… the regular market… seriously awesome wandering potential! Depending on where you are you can take a little water taxi to get to Granville Island or take it around the harbor! The market has some fun little food places, but the real winner is “GoFish” it is a tiny little walk along the sea wall but well worth it for some awesome fish tacos! It is also a bit of a picnic dining area so kids can run free and have a generally great time! Walk along “Spanish Banks”: There are SOOO many places to go for walks along the ocean. We decided to go for a little walk along Spanish Banks before dinner one night. The great thing about walking along the water is that it is so easy! I wore H in her carrier, but a stroller would have worked fine… as long as you don’t want to venture out onto the beach. Another great area to walk is Coal Harbor, which includes great places to run about and picnic… also the BEST gelato can be found on the corner of Burrard St. and Cordova St. (Bella Gelateria)… seriously your welcome! Stanley Park: The options here are immense! If it had been nicer I would have loved to rent a bike with a baby seat and gone around the park! Even a stroller around/through the park was very much missed this trip! When my brother was little a trip to Vancouver was never complete without a visit to the miniature train for a ride. I have spotted a water play area in the past that looked fun for the summer! There is also an aquarium! Lighthouse Park: Grandpa (my dad), H and myself managed to find a few minutes break in the rain to drive over to Lighthouse park and go for a mini hike. I remember visiting as a kid so it was fun to check it out again! Also it was fun seeing it from a different angle, as we checked it out across the water when we were walking along Spanish Banks. I would strongly suggest this or something similar for nature lovers and those that want to check out what the West coast rainforest is really like! Great tips. I’ve never been there and want to go to Vancouver so bad. What’s the kid market? I love exploring with my kids!!! We are always taking road trips and hikes. This looks gorgeous! My photos do not do it justice at all… But thank you! Exploring with kiddos is fun at any age! That top photo! WOW. What a gorgeous view. I’m glad you had fun. Thanks… I wish it had been a bit brighter, but it was a lovely walk! I didn’t realize Vancouver was so kid friendly. The photos are amazing because the scenery seems 100% untouched. Before having a kiddo I didn’t realize it was so kid friendly either! Oh this look like so much fun! I definitely need to make an extended trip to Vancouver to see more of the beautiful city.